The North Berwick Witches meet the Devil in the local kirkyard, from a contemporary pamphlet, Newes from Scotland. 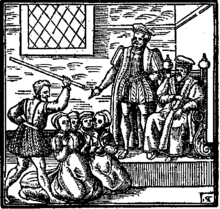 The North Berwick witch trials were the trials in 1590 of a number of people from East Lothian, Scotland, accused of witchcraft in the St Andrew's Auld Kirk in North Berwick. They ran for two years and implicated over seventy people. These included Francis Stewart, 5th Earl of Bothwell on charges of high treason. The "witches" held their covens on the Auld Kirk Green, part of the modern-day North Berwick Harbour area. The confessions were extracted by torture in the Old Tolbooth, Edinburgh. The main source for this story was published in a 1591 pamphlet Newes from Scotland and was subsequently published in King James's dissertation on contemporary necromancy titled Daemonologie in 1597. This was the first major witchcraft persecution in Scotland, and began with a sensational case involving the royal houses of Denmark and Scotland. King James VI sailed to Copenhagen to marry Princess Anne, sister of Christian IV, King of Denmark. During their return to Scotland they experienced terrible storms and had to shelter in Norway for several weeks before continuing. The admiral of the escorting Danish fleet blamed the storm on the wife of a high official in Copenhagen whom he had insulted. Several nobles of the Scottish court were implicated, and witchcraft trials were held in Denmark. One of the first Danish victims was Anna Koldings, who, under pressure, divulged the names of five other women; one of whom was Mail, the wife of the burgomaster of Copenhagen. They all confessed that they had been guilty of sorcery in raising storms that menaced Queen Anne's voyage, and that they had sent devils to climb up the keel of her ship. In September two women were burnt as witches at Kronborg". James heard news from Denmark regarding this and decided to set up his own tribunal. 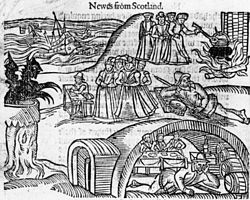 Very soon more than a hundred suspected witches in North Berwick were arrested, and many confessed under torture to having met with the Devil in the church at night, and devoted themselves to doing evil, including poisoning the King and other members of his household, and attempting to sink the King's ship. The two most significant accused persons were Agnes Sampson, a respected and elderly woman from Humbie, and Dr John Fian, a schoolmaster and scholar in Prestonpans. Both refused to confess, but were put to severe torture. Sampson was brought before King James and a council of nobles. She denied all the charges, but after being tortured horrifically, she finally confessed. By special commandment, her head and body hair was shaven; she was fastened to the wall of her cell by a witch's bridle, an iron instrument with 4 sharp prongs forced into the mouth, so that two prongs pressed against the tongue, and the two others against the cheeks. She was kept without sleep, thrown with a rope around her head, and only after these ordeals did Agnes Sampson confess to the fifty-three indictments against her. She was finally strangled and burned as a witch. According to Newes from Scotland, Declaring the Damnable Life of Dr. Fian, a Notable Sorcerer, a pamphlet published in 1591, Sampson confessed to attending a Sabbat with 200 witches, Duncan among them. Dr. Fian also suffered severe torture. He endured having his fingernails forcibly extracted, then having iron pins thrust therein, the pilliwinks, and the boot. He was finally taken to the Castlehill in Edinburgh and burned at the stake on 16 December. According to Christopher Smout, between 3,000 and 4,000 accused witches may have been killed in Scotland in the years 1560–1707. Agnes Sampson the eldest witch of them all, dwelling in Haddington; Agnes Tompson of Edenbrough; Doctor Fian alias John Cuningham, master of the school at Saltpans in Lowthian, of whose life and strange acts you shal hear more largely in the end of this discourse. These were by the said Geillis Duncane accused, as also George Motts wife, dwelling in Lowthian; Robert Grierson, skipper; and Jannet Blandilands; with the potter's wife of Seaton: the smith at the Brigge Hallis, with innumerable others in those parts, and dwelling in those bounds aforesaid; of whom some are already executed, the rest remained in prison to receive the doome of judgment at the Kinges Majesties will and pleasure. Gillis Duncan was also found to have conspired with Ewphame Mecalrean in the murder of Gillis Duncan's Godfather. Gillis Duncan caused the apprehension of Barbara Naper for bewitching to death Archibald Douglas, 8th Earl of Angus. Archibald was reported to have died from a disease so strange there could be no cure or remedy. Barbara Napier had come from a good family and had married a book dealer named George Ker in 1572. George died at La Rochelle in 1576 and she then married Archibald Douglas whose brother was the laird of Corshogill. Napier had bought charms to help her own health and to try and fix her poor relationship with the countess of Angus, Lady Jean Lyon who employed her and her husband. They did not work as she lost her job. When it all came to trial Napier was accused of a practice to kill the king by witchcraft but was only found guilty of the lesser crime of conspiring with witches. However the King appealed to reverse this verdict and although her fate is unclear it is thought likely that she was eventually burnt to death. Shakespeare adapted many concepts from the trials, including the rituals confessed by the witches and the Scottish setting, in his tragedy Macbeth. Heavily influenced by the incidents made public, the play was published a few years after King James's Daemonologie. Borrowing many quotes from the treaties, the three witches cast their spells in the same manner: "purposely to be cassin into the sea to raise winds for destruction of ships." Heavy/doom metal group Cathedral has a song called "North Berwick Witch Trials" on their 2005 album The Garden of Unearthly Delights. A recurring character, tried and convicted of being a witch, is named Geillis Duncan in Diana Gabaldon's Outlander series of novels. In the television adaptation she is portrayed by Lotte Verbeek. ^ Anne of Denmark, Ethel Carleton Williams. Longman, 1970. ^ Rosen, Barbara (1969). Witchcraft in England, 1558–1618. Univ of Massachusetts Press. ^ Guiley, Rosemary (2008). The Encyclopedia of Witches, Witchcraft and Wicca. Infobase. ^ Smout 1969, pp. 184–92. ^ a b "Translations and Reprints from the Original Sources of History". The Witch Persecution in Scotland. 3. Philadelphia, Pennsylvania: University of Pennsylvania. Dept. of History. 1912. pp. 19–23. Retrieved June 17, 2016. ^ Newes from Scotland, 1591, as reprinted in Pitcairn's Criminal Trials in Scotland, vol. 1, pt. 2, pp. 215-223. ^ Calendar State Papers Scotland, vol. 10 (Edinburgh, 1936), pp. 514-5. Smout, Thomas Christopher (1969), A History of the Scottish People 1560–1830, pp. 198–207 . Wikimedia Commons has media related to North Berwick Witch trials. "13", Memoirs of Popular Delusions, 2, World wide school, archived from the original on 2003-11-27 .